Graphic Arts Books, 9780944197011, 96pp. Welcome to Monument Valley Tribal Park--a world of weather-carved rock and wind-driven sand, of massive buttes painted with dark desert varnish, of hardy plants clinging to the earth. At dawn and sunset, an ever-changing sky silhouettes the dark-looming monuments against washes of color from delicate to vibrant. Monument Valley's Navajo residents live in harmony with this challenging, beautiful landscape. Dynamic forces of earth, wind, and water built and sculpted the dramatic forms of this land. The visible rock of Monument Valley--carved today into buttes, monoliths, and mesas--represents millions of years of contrasting land layers as ancient sands compressed over geologic time into rock. Then the vast Colorado Plateau uplifted, erosion cutting its softer surfaces back down, leaving pockets and markers of hard rock still standing. Grain by grain, wind and rain still carve the rock forms of Monument Valley. Ancestral Puebloans settled into the recessed rock alcoves dotting this region more than a thousand years ago. Only fragments of their lives--masonry dwellings, hand-formed pottery, rock art--remain. Many generations later, the Din --the People--established a homeland in the red rock country and a community based on harmonious life between Mother Earth and Father Sky. Harry Goulding came to Monument Valley with his young wife, Mike, in 1924 to establish a trading post at the foot of Big Rock Door Mesa. They raised sheep, traded handwoven Navajo rugs for food and household items, and hosted an ever-growing number of curious visitors. During the difficult Depression years of the 1930s, the Gouldings attracted early moviemakers to Monument Valley. John Ford's films created an entire generation of moviegoers' views of the American West--and travelers from around the world have visited Monument Valley ever since. The Navajo Tribal Council established Monument Valley Tribal Park in 1958. Now this place of traditional lifestyle and spectacular scenery is preserved for its beauty as well as its ancestral and contemporary importance to the Navajo. Those who travel here find not only the rich history of this desert place, but a sense of Monument Valley's special harmony as well. Let the rhythm of this land thrum through your soul; let the voice of its spirit call you home. David Muench has been capturing images of the natural drama of our planet for more than fifty years. 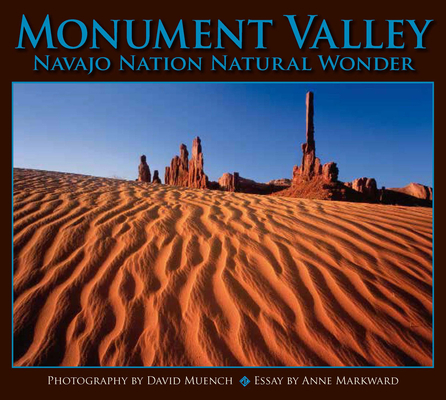 This book contains both color and black-and-white images of the iconic and sublime Monument Valley locations that he has revisited numerous times in his photographic career. Traveling back and forth across the American continent and to far-flung corners of the earth, capturing the character and magnificence of wild Earth, his photographs champion the Earth's wild beauty and the necessity for its survival. His images have appeared in numerous publications, including Arizona Highways, Outdoor Photographer, Wilderness, Sierra, Life, View Camera, and many others. His fine-art prints are on display at the Brooker-Muench Gallery in Jackson, Wyoming, as well as in other gallery and museum exhibits. Most recent of his fifty previous exhibit-format books published by Graphic Arts Books are David Muench's National Parks, Arizona, California: Portrait of a State, Plateau Light, and Primal Forces. Anne Markward, a writer with a background in sustainable tourism, is passionate about the cultural history and subtle beauty of the American Southwest. Based in Durango, Colorado, she is also essayist for Lake Powell, another title in the Companion Press series.